We explore how and in what ways the surrounding environment can be an important factor in human perception during interactions with virtual humans. We also seek to leverage any such knowledge to increase the sense of Social/Co-Presence with virtual humans. We conducted a user study to explore the influence of environmental events on social interaction between real and virtual humans in a Mixed Reality setting. 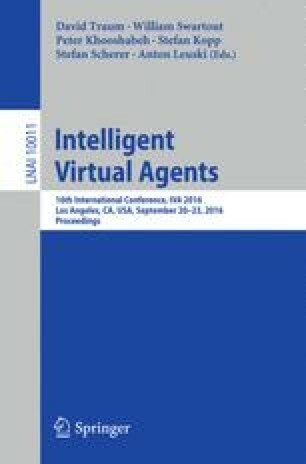 Specifically we tested two different treatments to see the effects on Social/Co-Presence: (i) enhanced physical-virtual connectivity/influence via a real fan blowing on virtual paper, and (ii) the virtual human’s corresponding awareness of the environmental factor as she looks at the fan and holds the fluttering paper. While a statistical analysis for the study did not support the positive effects of the two treatments, we have developed some new insights that could be useful for future studies involving virtual humans. The work presented in this publication is supported primarily by the Office of Naval Research (ONR) Code 30 under Dr. Peter Squire, Program Officer (ONR awards N00014-14-1-0248 and N00014-12-1-1003). The authors would like to thank the members of the SREAL, UCF including Salam Daher, Jason Hochreiter, Eric Imperiale, Myungho Lee, Dr. Andrew Raij.